Over 2,500 years ago, in Athens Greece, playwrights like Sophocles introduced a form of theatrical art known as the tragedy. Greek tragedies typically dealt with weighty themes such as betrayal, loss, pride, jealousy, rage, love, courage, honor, life and death. Often these dance-dramas also explored man’s relationship with God and the existential challenges that are part of the human condition. Actors wore elaborate masks with exaggerated facial expressions so that their character’s role, emotional state, and intentions might be accessible to the audience. Commonly, one actor played several characters during the course of the theatrical performance, changing masks for each character and sometimes for each scene. Fast-forward to our lives today and the Greek tragedy might be used as a metaphor for some of the key aspects of recovery from trauma and addiction. Like an actor in a play, often we are reacting to life’s existential challenges according to a script. This script can influence how we move about on the stage of life; it can spell out our roles in relation to others, how we think and feel, and how we act in various situations. From the first moments of conception and throughout development, by way of ongoing interactions between ourselves, others, and the environment, this narrative is written into our psychobiology — it becomes an implicit script in the mindbody system. experiences, maybe without even being aware of the script. becoming over-identified with the personas, forgetting who is actually looking through the masks. We become disconnected from the truth of who we really are and we cannot see the truth of others around us. our truth and from people that we love. 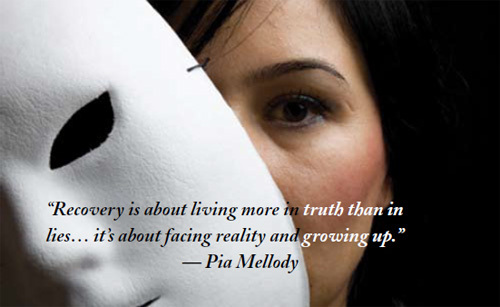 For several decades, Pia Mellody has been encouraging people to remember and rediscover the truth behind the masks and to face reality without addiction. For her, what started as a journey to understand the dis-ease of codependence, so that she could better help her clients, turned into an elegant, comprehensive model for addiction recovery. This model continues to be used at The Meadows of Wickenburg, a world-renowned treatment center, and has been a source of healing for many patients and practitioners. can be overt (i.e., big “T”), as in the case of physical or sexual abuse, or covert (i.e., little “t”), as in the case of emotional abuse, abandonment, enmeshment, and loss/death. Relational trauma of this kind often results in deep wounds, painful paragraphs in our mindbody scripts, which can lead to developmental immaturity and negative consequences for adult functioning. More specifically, Pia Mellody found that people usually entered recovery treatment because of addiction, mental/emotional symptoms, resentment/anger, negative control of others, intimacy/relationship problems, and impoverished spirituality. However, usually these issues only become “problems” because other people tell the person in treatment that they are indeed problematic! Yet, given an opportunity to step back from the tornado of unmanageability created by these issues, most people in treatment are able to admit that help is necessary. 5) moderation (too little versus too much self-control). Furthermore, she discovered that when people are able to address their childhood wounds and identify their core issues of developmental immaturity, they discover a measure of reprieve from the secondary symptoms of addiction and relationship turmoil. Pia Mellody has consistently taught that the recovery process requires that we honestly and courageously face the truth of our past, both what has been done to us and what we have done to others. It is no coincidence that she titled her now-classic book “Facing Codependence.” As suggested by Pia Mellody, “The recovery process is about living more in truth than lies.” Yet, paradoxically, the painful truth of our mind-body scripts is what drove us to hide behind the masks and disconnect through addictive processes. The prospect of facing the reality of our condition doesn’t appeal to many people — that is why the bottom can be so low. bend. Remembering the powerless and unmanageability of our past can invite the willingness we need to surrender to the recovery process. Be willing to accept help. Recovery isn’t a solitary affair. Often we need the help of a director or producer when facing the truth of our tragedy scripts. Guidance and support can be found in friends and family, recovery communities, professional treatment, and something or someone wiser and vaster than us (i.e., nature, spirit, higher power, etc). judgment and blame. Let us be kind to ourselves. sensations, emotions, and thoughts associated with our implicit scripts, we find that these mind-body states are generally transitory, like storm clouds moving across a desert landscape. Gradually, our recovery can become imbued with a quiet confidence that we can weather life’s storms. Recovery is about growing up. If trauma leads to developmental immaturity, as suggested by Pia Mellody, then recovery must be a maturational process. Don’t fight it – let go of old ways and exercise a willingness to embrace new, more mature ways of living. Recovery involves grieving. As we more fully inhabit and live from our truth, we can expect to grieve what we didn’t ever receive, what we lost along the way, and the gradual disillusion of the fantasies that we created about ourselves and others. with, our various masks – we are able to more comfortably embody the person looking through the masks. our deepest wounds. However, at the same time we are able to make intimate contact with our own immutable and unconditional worth. path of recovery by facing the truth behind our masks.